The shower water filter cartridge is an inexpensive six-month filter cartridge. It fits the Rejuvenation Science® Shower Filter and was designed to utilize Chlorgon's® advanced filtration capabilities for removing both free and combined chlorine. Does NOT include showerhead or filter housing. Reuse your current shower head and filter housing. Additional $4 per filter may be added for shipments outside the U.S., and to Hawaii & Alaska. A: They either love them or hate them. Some customers prove their strength using tools to over tighten the filters. The filters are made out of plastic and will break if over tightened. Be gentle and you will be satisfied with the installation. It may be necessary to use pliers to remove an old showerhead. But hand tightening should be sufficient to install a clean new device. If it doesn’t leak, it’s tight enough. Other customers had low water pressure and were dissatisfied with the flow. 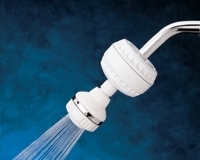 Tall customers are annoyed that the height of the showerhead is lowered by 1½ inches. To them we sing, “short people are . . .” The remainder of customers are generally thrilled and thank us for making their and their loved ones lives better.